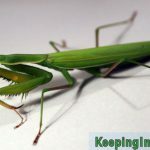 The European Mantis, or Mantis religiosa, is a mantis species originally from Europe but has established itself in North America too. It was imported from Europe to North America in the 1600’s to combat plant pest insects. 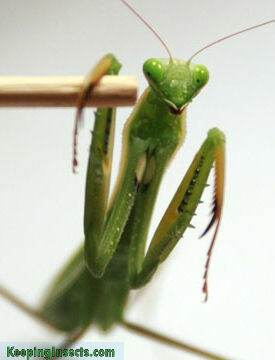 It is seen as the archetype of a mantis. This species of praying mantis is light green, with a little variation in color tone. The species is easily distinguished from other species by the pattern on the inside of the front legs. 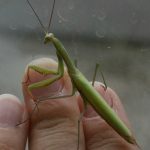 Most species of praying mantis have small dots or specks at this part of its legs, but Mantis religiosa has a very clear pattern: at the top of the legs there is a black spot with a white dot in the middle. This mimics the eye of a predator. There are also yellow dots on this part of the forearm. 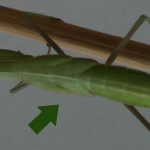 The lower parts of the front legs have a yellow dot. The pictures will clarify this. 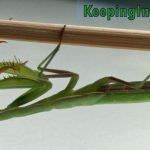 The females of this species become about 8 cm long, the males around 7 cm. The males are more slender and have longer wings than the females. 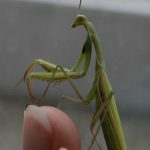 The males have long antennae, the female has shorter ones. 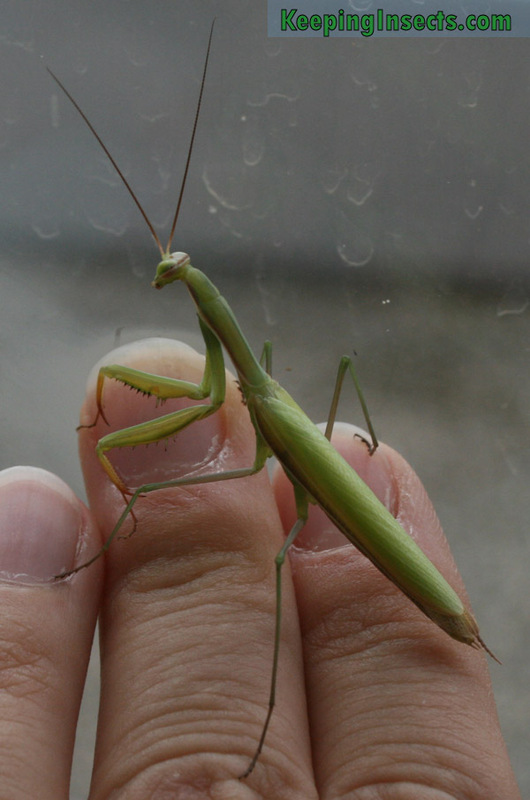 Mantis religiosa praying mantises are quite fierce mantises. It actively chases after its prey once it is aware of it. But during the non-feeding hours they generally sit still and wait for a prey to show up. 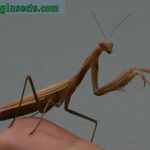 When you annoy the mantis, it can show its deimatic display. Then it will show the inside of the forearms and raise its wings. It is quite stressful for these animals, so do not chase it too much! The ideal temperature is between about 23 ° C – 28 ° C. At night you can allow it temperatures to drop a bit more. 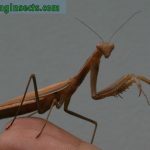 This species does not have high demands regarding the humidity, but it is important that you allow the mantis to drink around 2 – 3 times a week. A target air humidity is about 40 to 65%. 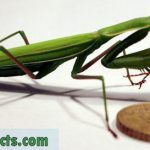 As with all species of praying mantis, this species needs housing that is at least 3 times the length of the mantis in height, and at least 2x the length of the mantis in width. For an adult this means is at least 27 cm in height and 18 cm in width. A nice size for a terrarium would be 30 x 30 x 30 cm, so there is room for lots of fake plants and perches. 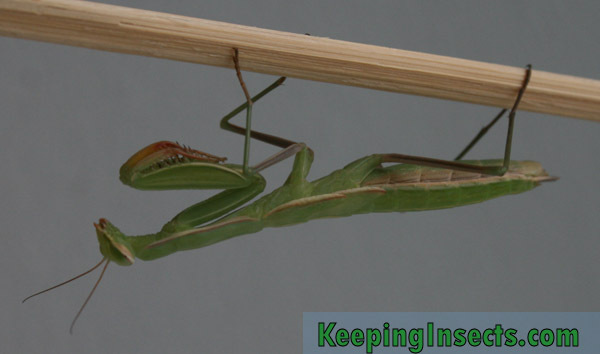 You cannot keep Mantis religiosa with more than one mantis per enclosure. 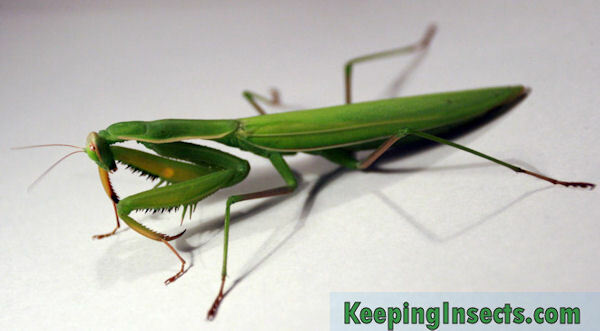 If you put some mantids together, they will attack and eat each other. Small nymphs, until L3, can be kept together in one enclosure when you provide them with lots of food and space. 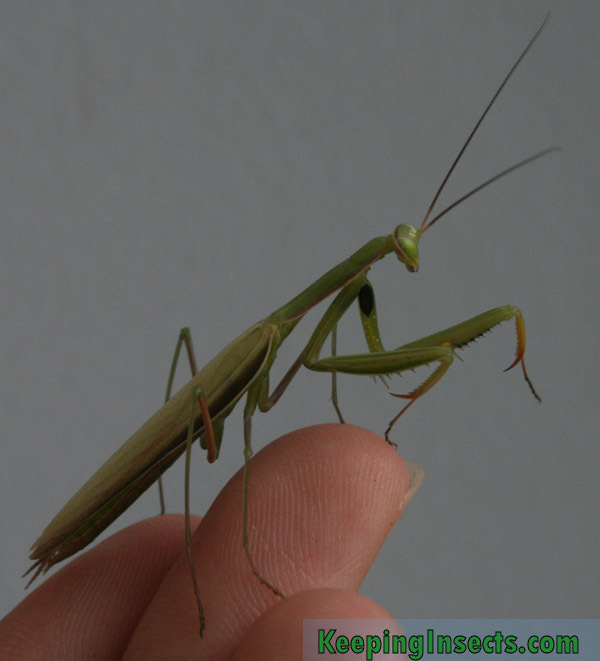 This is an adult female European Mantis – Mantis religiosa. The 50 Eurocent coin is for size reference. 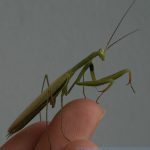 It is possible to breed the European Mantis in captivity. It is not the most easy species, but it’s definitely possible for the insect enthousiast to breed the European Mantis. First you will need a male and a female. Males and females can be distinguished from one another when they are adult or when they are nymphs. 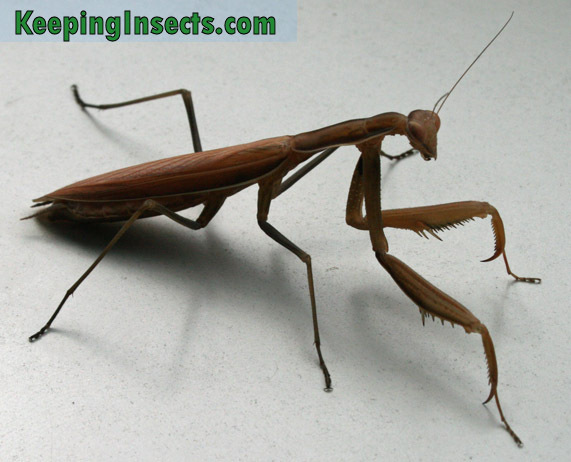 Adult males are more slender and have longer wings and longer antennae than the females. 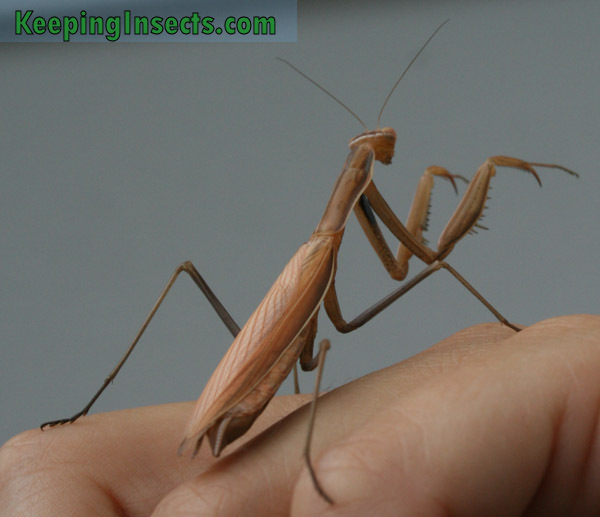 When the mantids are nymphs of the fourth instar or larger, you can use the segment counting method. Approximately 2 to 4 weeks after the mantids reach adulthood, a mating attempt could be made. The female should eat a lot before you introduce the male to her. If she acts aggressively towards him, remove him and try again later. Mating can take several hours, the male must subsequently be removed from the enclosure to make sure it will stay alive. The ootheca of this species that come from Europe need a diapause to develop. 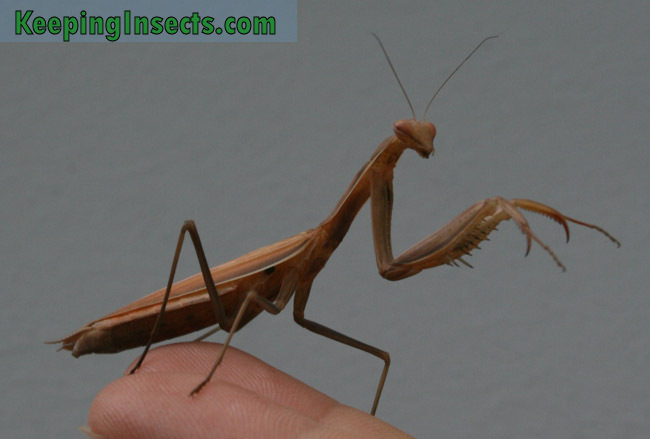 This is a period of cold in which the eggs inside the ootheca do not develop. 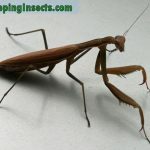 When you do not put the ootheca for 6 to 8 weeks in a cold environment the nymphs that hatch from the ootheca will be weak. 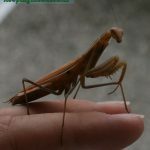 Check out our Mantis Ootheca Care Page for general information about keeping ootheca to hatch a lot of mantis nymphs. 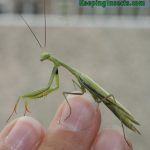 You could catch Mantis religiosa in the nature of Spain, France, Eastern Europe or North America… but why would you take something out of nature? 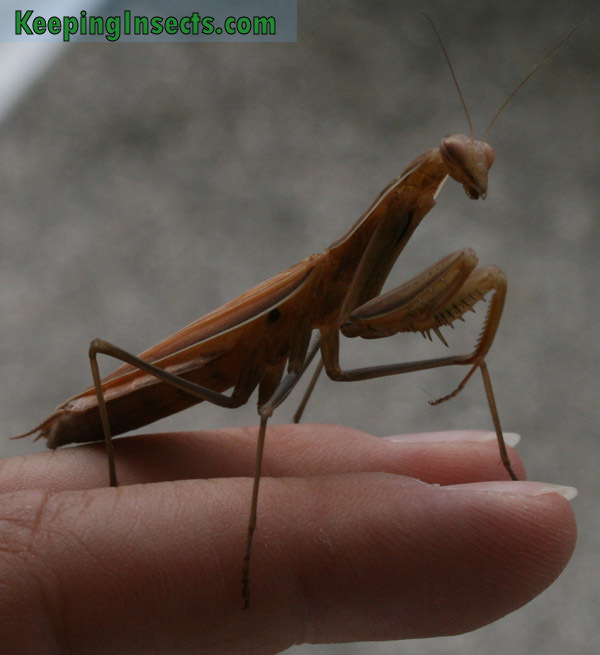 Make sure you know how to take care of the mantis and think about why you are taking it. 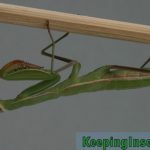 Maybe it is better to leave it in its natural habitat and buy a captive-bred mantis instead. This does not impact the natural population. 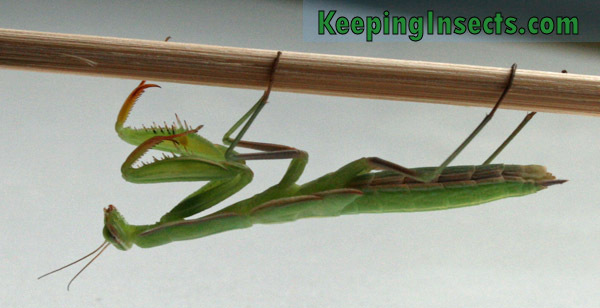 In some countries Mantis religiosa is a protected species, catching them is illegal. The wingbuds indicate the final molt will be soon.